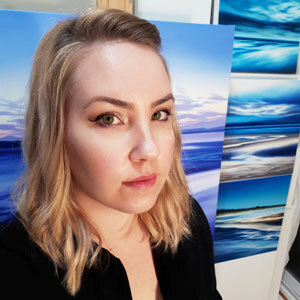 Kylee is a Canadian artist, born and raised in Ontario and currently living in Port Alberni, British Columbia. She shows her work in a number of galleries around Vancouver Island. Growing up with the constant exposure to her artist father, she picked up an appreciation and excitement for creating art. She completed the Fine Art program at Toronto’s Centennial College in 2009. Since then, she has continued to develop her skills as a fine artist working primarily in acrylic and oil paint. Rocks On The Shoreline - 30" x 15"
Evening Beach Tide 36" x 36"
Before The Rain - 30" x 60"